Music brings healing to the soul. If you love to travel long distances, then you would appreciate having good music in your automotive. If you are a lover of music and you are looking for ways to install a second car battery for your automotive, then this article is dedicated to you. Most of us love to travel and sometimes maybe with family or friends. Imagine driving for over 8 hours in a dumb car. This could be boring. That is the reason why you need to hook up your automotive with a second battery. Here are reasons why you need a second car battery for your automotive and how to install it. Why an extra battery for your automotive? When your car engine is not running and you are just using some of your car accessories, then you can definitely use the power from your car battery. This is because, your car battery is powerful enough to supply the needed energy. However, in the event that you leave your headlights on for a longer period of time, you are most likely going to drain off the charge from the battery of your automotive. This means that you would have to install a much bigger battery or install a second battery, which is the best option. The main reason why you need to install a second car battery is to have unrestricted use of your automotive's accessories even when the engine is running. Let’s say for example you go for a road trip and camp out somewhere, using a single car battery could easily drain its power quite fast. However, if you install a second car battery, you will be able to enjoy your car’s accessories for a longer period of time without having to worry about running out of power charge. If you also love to park your automotive and listen to your favourite jams for hours, then you need to install a second battery for your automotive. Having a good stereo system for your car with great bass tones and powerful amplifiers could improve the quality of music in many ways. These powerful amplifiers and cross –over boxes are connected to your speaker in order to produce the best bass tones and make your car stereo system to sound better. However, most people do not realise that these speakers and huge amplifiers do drain off the energy from your car battery pretty fast and before you realise, your battery is dead. People who are smart, add a second car battery. Park your automotive and turn the engine off before you being the whole installation process. 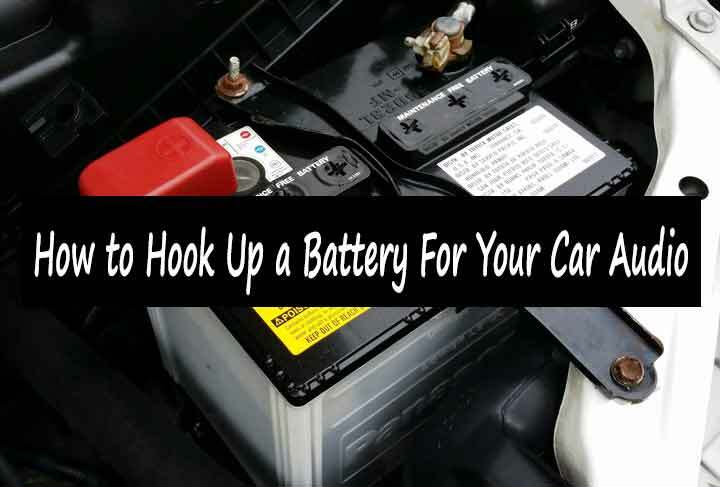 You need to then open your hood and disconnect your car battery. Get hold of a wrench and disconnect the negative terminal connection. You need to identify where you are going to install the second car battery. Most people prefer to install the second car battery at a place where it is safe and convenient. This is mostly at in the trunk of the car, right beside the amplifiers. This makes it even better because the music system components are strategically in close proximity with the additional car battery. It will make the wiring process much easier. However, if your car stereo components are located in different place and not the trunk, you still can install the second car battery near it or just make sure you have enough wire to connect the battery in the car trunk to the amplifiers location. Carefully install the battery. Get a battery box and use a drill to make holes through the installing tabs and straight to the floor of the trunk. Get the hardware that is in the battery box and put a bolt on each hole you created on either side. Make use of a wrench to tighten the bolts to secure the battery in position. Step 3-Connect the battery to the audio system. After all that is done, you now need to carefully wire the second car battery. First begin connecting the positive side. Connect using a copper wire that has a heavy gauge. Use at least 2 gauges and place a piece of the copper wire from the positive side of the second car battery to the power lug of the amplifier that is nearest to the positive terminal. Get a wire stripper and carefully remove some of the plastic cover on the cables just a little to allow you create terminal ends to each side of the wire. After that you can then connect one side to the positive terminal of the battery and the other on the power lug of the amplifier. Tighten the wires using a wrench. Get a ground wire from the negative side of the second car battery that will pass through the floor of the trunk. Tighten the clamp using a wrench and fasten the other end of the floor by placing a big self-tapping screw through the eye of the cable and tighten it to the floor. Make sure that both the negative and positive terminals are well connected. You can now close your car trunk and the hood. In conclusion, here are some of the benefits of having a second car battery for your automotive. Installing a second car battery will elongate the lifespan of your original car battery. This is due to the fact that the additional car battery acts like a back-up for the original battery, hence will increase its lifespan. You can now be able to listen to music for longer periods without having to worry about draining the charge off your car battery. This makes going on road trips with your automotive more fun. It saves on your time and money. A second car battery will help you save on some of these resources like time and money. You do not have to buy a new car battery every time the old one gets worn out. An additional battery will act like a backup for the original car battery.